Accessibility services include installation and maintenance of equipment and safety products. We can also provide service on accessibility products even if we were not the original installers. Our general contractor has over 30 years of experience and has accredited expertise in Universal Design standards and solving all accessibility needs. Lift and Accessibility will fulfill the warranties that our suppliers include with their products. Most products we install come with at least a one year warranty on labor and two year warranty on parts. (Some drive train parts are guaranteed for five years.) We can provide service on your equipment beyond the warranty period, even if we were not the original installers. For decades nurses, therapists, and aides were told that using good body mechanics was enough to protect them from injury, but cumulative trauma to the spine and musculature is a reoccurring event in the healthcare field. Subsequently, floor lifters were invented to help alleviate the lifting. Although these lifts helped to alleviate the weight, they did not resolve the problems that healthcare staff faced on a daily basis. 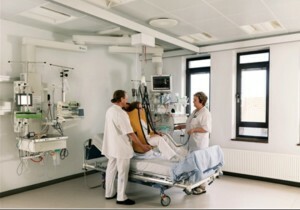 Hospitals in Europe and the United States are now converting to Ceiling Lifts to reap the benefits. 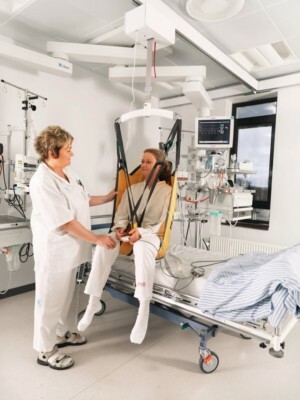 The integration of various patient lift and repositioning solutions into the nursing home will be a strategic financial decision, and if carefully planned and executed will lead to long-term benefits. Taking aggressive steps to reduce back and musculoskeletal injuries for health care workers in your facility will not only increase efficiency and enhance patient comfort and safety, but significantly reduce the costs associated with time away from work due to injuries. Lift & Accessibility Solutions can set up a 1-30 day demonstration at your Northern California facility. Call us today for more information!